Who actually needs constitutional amendments in Armenia? The ruling party represents that as a sign of strengthening the democratic process in the country, but many experts say that the updated constitution favors Serzh Sargsyan and his party to stay in power. The Armenian National Assembly approved the constitutional reforms on October 5 without any apparent reasons and social requirements after several months of intense debates and political protests against it. Under the new draft, the parliament will be able to appoint and dismiss the prime minister. The president, in his turn, who now shares his power with the prime minister, will be elected every seven years instead of five by the MPs and representatives of local authorities. In fact, if the new Constitution is adopted, Armenia's parliament - the National Assembly - will be the most powerful branch of government in the country. Prime Minister and the Cabinet will have powers which formerly belonged to the president to develop and implement internal and external policies. According to the draft amendments, the National Assembly (unicameral parliament) elected for five years under the proportional system must have at least 101 members. Otherwise, the second stage of voting is supposed to be held, and the winner of the second round receives additional mandates. 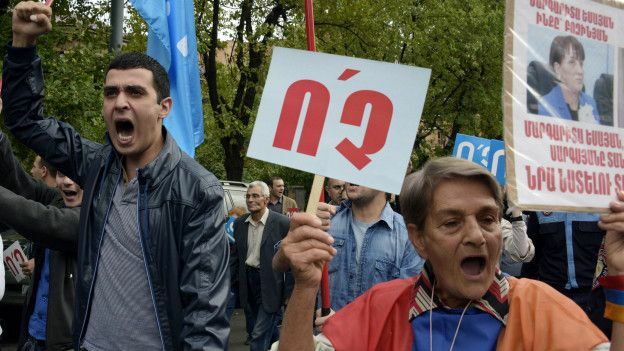 Critics say such a system suppresses positive sides of democratic parliamentary republic and strengthens the impact of only one party as the second round of elections will allow the stronger party to extrude weaker rivals. The main concern of the opposition is that these constitutional changes are made in order to keep President Serzh Sargsyan in power after his second and final term that expires in 2018. If these constitutional amendments are adopted, it will allow Sargsyan to rule the country, either as the parliament’s speaker or the prime minister, as well as will entrench his political force, the Republican Party of Armenia in the power. Despite numerous protests and the apparent reluctance of both the people and many politicians, it seems like the current government is not planning to stop. For instance, the authorities spent large amounts of money on preparing the referendum, while the country is sinking in debt. The country’s opposition has already formed several protest groups opposed to the constitutional reforms, such as "Do not spend!," The Front of National Salvation, "No!" and "New Armenia".